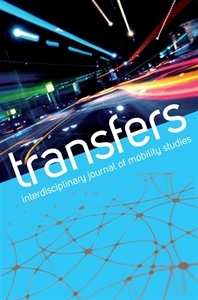 Transfers: Interdisciplinary Journal of Mobility Studies is a new peer-reviewed journal publishing cutting-edge research on the processes, structures and consequences of the movement of people, resources, and commodities. Intellectually rigorous, broadly ranging, and conceptually innovative, the journal combines the empiricism of traditional mobility history with more recent methodological approaches from the social sciences and the humanities. The journal's scholarly essays, book and exhibit reviews, artwork and photography, as well as special features provide a rich variety of perspectives that include: analyses of the past and present experiences of vehicle drivers, passengers, pedestrians, migrants, and refugees; accounts of the arrival and transformation of mobility in different nations and locales; and investigations of the kinetic processes of global capital, technology, chemical and biological substances, images, narratives, sounds, and ideas. Convened around a broad conception of mobility, Transfers provides an interdisciplinary platform to explore the ways in which experiences of mobility have been enabled, shaped and mediated across time and through technological advances.